These free kitchen island plans will help you build a fabulous kitchen island that will become the focal point of the room. Not only will this add some pizzazz, but the extra countertop and storage space are just some of the many benefits of having a kitchen island. All the free kitchen island plans below have their own features so be sure to think about what you want from a kitchen island before choosing your plan. 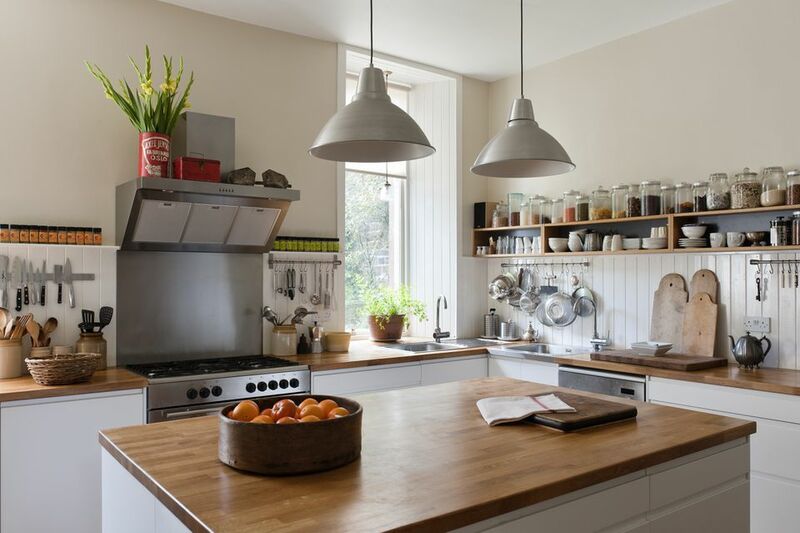 Sometimes you can modify the plan to add extra storage and you can usually tweak the design or finish to get a whole different style that's perfect for your kitchen. These free kitchen island plans include diagrams, shopping lists, cut lists, step-by-step building instructions, and color photos to help you along every step of the way. This huge kitchen island has two cupboards with shelves, open shelving, and huge drawer perfect for a farmhouse kitchen. This free kitchen island plan includes dimensions, a materials and tools list, a cut list, directions, and user photos. 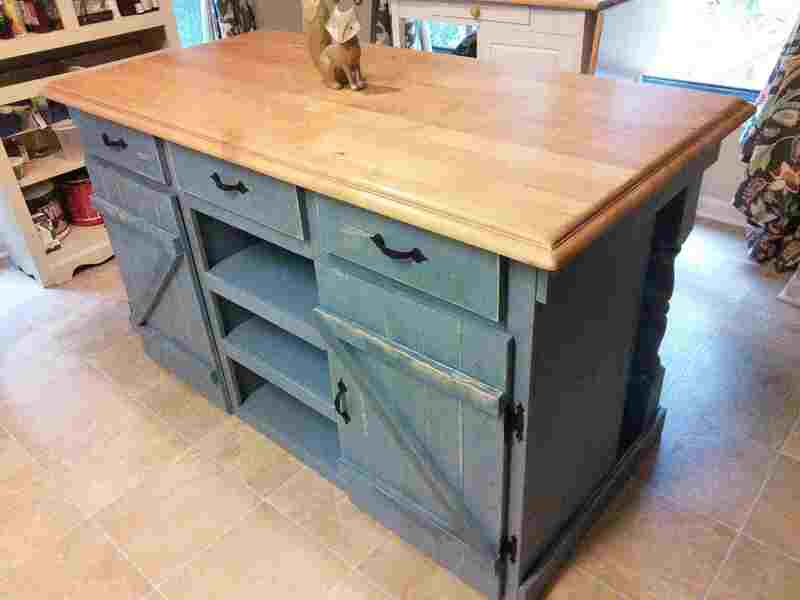 This free kitchen island plan from Old Paint Design builds a rustic kitchen island with drawers and a lower shelf for storage. Can you believe this great looking island costs less than $100 to build? Diagrams, color photos, a shopping list, a cut list, and written building directions are all part of this free kitchen island plan. This free kitchen island plan from Shanty 2 Chic builds a kitchen island that will even fit in small spaces. The design includes a large workspace, lower open shelf, wheels to make it portable, and a towel bar. This free downloadable plan includes a supply list, cut list, written instructions, diagrams, and photos. Make your kitchen island dreams come true with this beautiful build that includes open storage plus a pull-out bin for your trash can. These free plans include a tools list, shopping list, cut list, building directions, and photos. This unique DIY kitchen island is topped with hardwood flooring for a butcher block feel at a fraction of the price. This free plan has color photos, building instructions, and lots of tips on how to save on materials. This rustic but modern kitchen island includes two shelves, large drawers, and a wood top. It could be stained or painted to match just about any style of kitchen. You can use this kitchen island plan with its diagrams, materials and tools list, cut list, and step-by-step directions to start building today. Our Vintage Home Love has a free kitchen island plan which uses aged wood to give it a nice rustic look. Color photos and clear written instructions will walk you through building this beautiful and functional kitchen island. Cherished Bliss has designed a small but mighty kitchen island that has two cabinets, four drawers, a butcher block countertop. This free plan includes a supply list, lumber shopping list, cut list, building directions, diagrams, and photos to help you build it. Just because you have a small kitchen doesn't mean you can't have a kitchen island. This free kitchen island plan builds a great looking one for less than $50. Tons of color photos, a supply list, and written instructions are included in this free kitchen island plan. This free kitchen island plan builds a large kitchen island complete with two storage shelves, a push-through drawer, and a double-sided cabinet. If you like the style but are short on the space, Designs by Studio C also has a free plan for a smaller version. Everything you need is included in this free kitchen island plan, a materials list, cut list, diagrams, and written directions. This free plan for a kitchen cart will double nicely as a kitchen island but offer more flexibility since you can move it. Step by step instructions, a materials and tools list, user comments, and videos are included in this free kitchen island plan. HGTV has a free plan that builds this movable kitchen island where you build your own custom cabinets and drawers. The free kitchen island plan includes a materials and tools list and written instructions. Here's a plan for a simple kitchen island that's perfect for the beginner woodworker. Drawers, a pullout waste bin, a drop leaf top, and shelves for storage are all part of this free kitchen island plan. Blueprints, 3D animation, color photos, and general instructions are all part of this free kitchen island plan download. Rockler has a free kitchen island plan that uses pre-built cabinet panels for the sides and a butcher block from the top. Using pre-built materials will save you a lot of time in building your kitchen island. Written instructions, color photos, and a PDF download of the blueprint and material list will make build this kitchen island a breeze. The Fill has a free plan for building a kitchen island out of base cabinets. If you're looking for a professional looking island that doesn't take much work, this is a great DIY project. The plan takes you through the process of picking a spot in your kitchen for the island, shopping for your supplies, connecting the cabinets, fastening the cabinet to the floor, adding power, and adding finishing touches.